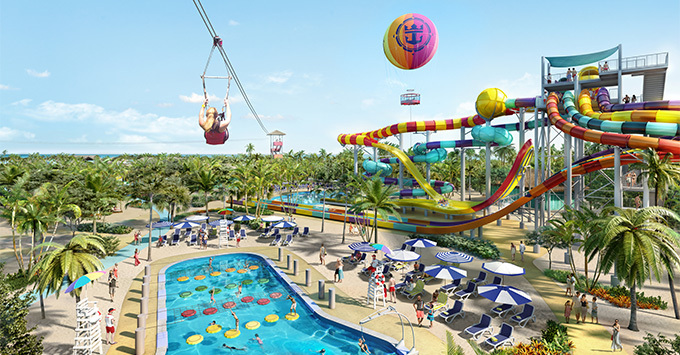 (7 p.m. EST) -- Starting in fall 2019, Royal Caribbean cruisers visiting CocoCay -- the line's private island in the Bahamas -- will find an array of new attractions waiting for them, including more than 10 waterslides, a wave pool, helium balloon ride, zip line and freshwater pool. The $200 million overhaul of the island is part of the line's "Perfect Day Island Collection," a just announced private island revitalization program. "At Royal Caribbean, it's not just about the hardware," said Michael Bayley, president and COO of Royal Caribbean International. "Our destinations are an equally important part of the cruise vacation. We are introducing Perfect Day Island Collection to ensure that we deliver the most memorable vacation for adventure seekers on land, as well as on board our ships. "When you name a place Perfect Day, you're making a big, bold claim, but it's one we're going to deliver on," Bayley added. 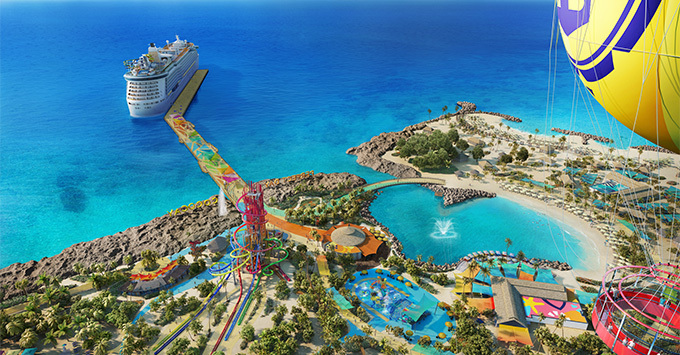 CocoCay will be the first island to undergo a Perfect Day transformation, which will see the island receive seven distinct island experiences, starting with a colorful arrivals plaza where cruisers will find live music waiting for them when they arrive. They'll also find their first taste of fun with a 30-water-cannon galleon to play around with and the Sprayaway Geyser, which sprays water 82 feet in the air. Also part of the arrivals plaza area will be two places to grab a drink or a bite to eat. Captain Jack's will be the island's hangout and meet-up spot, and will feature a neat rowboat bar. Bar bites, priced a la carte, will include chicken wings and crispy steak fries. For a heartier meal, Skipper's Grill will offer complimentary lunchtime favorites such as burgers, sandwiches, tacos and salads. Practically within the arrivals plaza, cruisers will find the entrance to a 1,600-foot-long zip line that takes cruisers across the harbor and ends with a splash water landing, as well as Royal Caribbean's largest and only land-based Splashaway Bay with an array of fountains, pools, sprinklers and whirlpools, plus five kid-sized waterslides and two massive drenching buckets. Splashaway Bay might be great for the little ones, but older kids, teens and adults with a hankering for an adrenaline rush will gravitate toward the island's Thrill Waterpark. Inside the extra-fee venue, visitors will find two water towers (Daredevil's Tower and Family Tower) with 13 slides -- the most waterslides found in any waterpark in the Caribbean -- as well as the Caribbean's largest wave pool. For those with smaller kids in tow, Adventure Pool, a kid-friendly obstacle course pool with lily pads, a rock-climbing wall and swing ropes also will be available. Daredevil's Tower, one of the two "towers" inside Thrill Waterpark will have seven water slides, including twin Dueling Demons drop slides and twin Manta Raycers slides. Other slides are the high-speed, fully vertical Screeching Serpent; the coiling Green Mamba; and the 135-foot-tall Daredevil's Peak, which will become the tallest waterslide in North America. Less adventurous waterslide enthusiasts will want to head up the Family Tower, which will have six multi-rider slides including The Twister, a winding tube slide for two sharing a raft; The Slingshot, a zero-gravity slide for four; and the four-land Splash Speedway racing slides. Prices for entry to Thrill Waterpark will be for either a half-day day pass or a full day. Also being added to CocoCay will be the largest freshwater pool in the Caribbean. Oasis Lagoon will provide three coves for swimmers to explore, a swim-up bar for grabbing an ice-cold Coco Loco, and three mini swim-up islands with in-water loungers for lazing the day away. Those looking to splurge can rent a private cabana for the day, complete with a personal cabana attendant. With Up, Up and Away, CocoCay visitors can hop into a colorful helium balloon -- for a fee -- and soar 450 feet into the air above the island for birds' eye views of the Bahamas. Those who just want to grab a spot on the beach and spend the day in and out of the water will want to make their way to Chill Island. In addition to a beach, Chill Island will feature wave runner excursions, boat tours, and snorkeling, as well as a selection of cabanas and daybeds for rent. Beachgoers here won't have to venture far for a bite to eat or drink; beach bars with roaming bartenders will take care of keeping visitors topped up and the complimentary beachside Chill Grill will be the largest dining venue on the island. 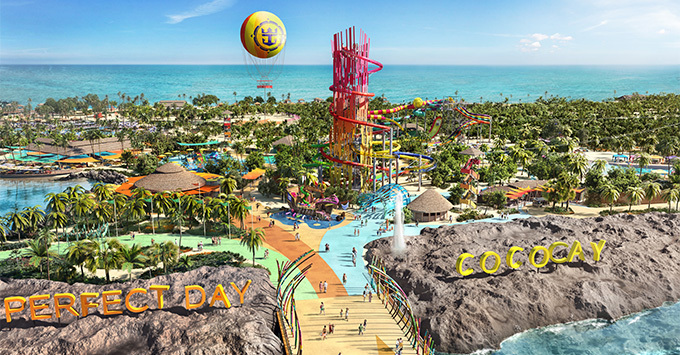 As if one beach wasn't enough, CocoCay will also have the more action-oriented South Beach, where visitors will find volleyball, beachside basketball, soccer, paddle boarding, glass-bottom kayaking and even zorbing in an inflatable zorb ball. The nearby Snack Shack will serve up both free and extra-fee quick bites or cruisers can wade out to the floating bar to get a drink. When the action gets to be too much, teepee cabanas and daybeds will be available for napping in the shade. For cruisers seeking a more upscale private island experience, Coco Beach Club will offer an exclusive retreat with luxe amenities like the overwater cabanas that each include an overwater hammock, waterslide and private attendant. Elsewhere, beachside cabanas and daybeds will offer privacy. Also inside Coco Beach Club will be a freshwater infinity-edge pool and bar, spanning an expansive 2,600-feet and a Beach Club visitor-only Mediterranean dining venue. Entry into Coco Beach Club is available to all visitors and the entry fee will range from $60 to $100. Perfect Day at CocoCay will roll out in phases, beginning in September 2018 with the completion of the pier. The majority of the island's attractions will launch in spring 2019. Coco Beach Club, the final piece to be completed, is set to open in November 2019. Additional Perfect Day Island Collection destinations in the Caribbean, as well as in Asia and Australia will be announced at a later date.